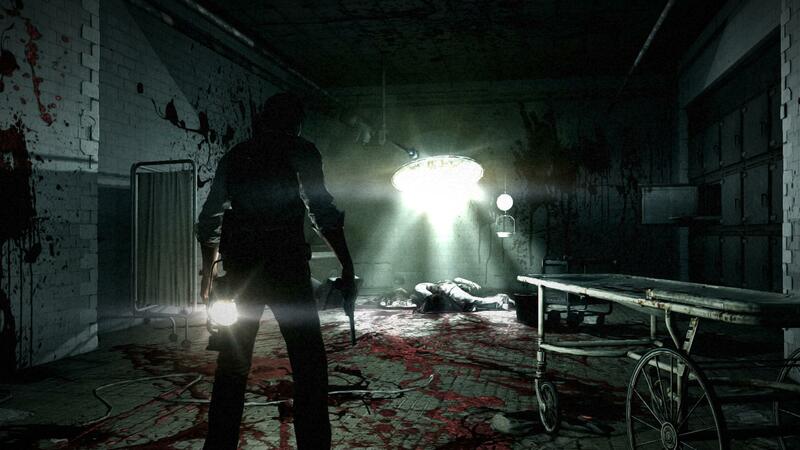 Shinji Mikami and Tango Softworks wants their debut game, The Evil Within, to scare you. It’s that simple and that raw. And judging from the hands-off demo I saw, it just might succeed in spades. Bethesda Softworks held a demonstration behind closed doors in mid-May where I was able to see about 15 minutes of the game in action. Much of what was seen we’ve had glimpses of in screen shots, only now I was able to see those moments in their proper context. SPOILERS for the demo begin now so if you want to be completely surprised when you fire up this game for the first time, skim down until you see “END SPOILERS.” Keep in mind that my thoughts on specific scenes and moments in the demo are also contained within this section. The demo begins with Detective Sebastian Castellanos, and two other detectives in tow driving to the scene of a mass murder. Close-ups on a mouth, a stubbly chin and eyes reveal only a glimpse of our avatar as he uses the CB in the car to suss out exactly what they are expecting to find. Once they have arrived outside of an old, yet still functional asylum–at least it was prior to these events–the three detectives emerge from the car and notice the other cop cars already at the scene. Everything is disarmingly quiet. 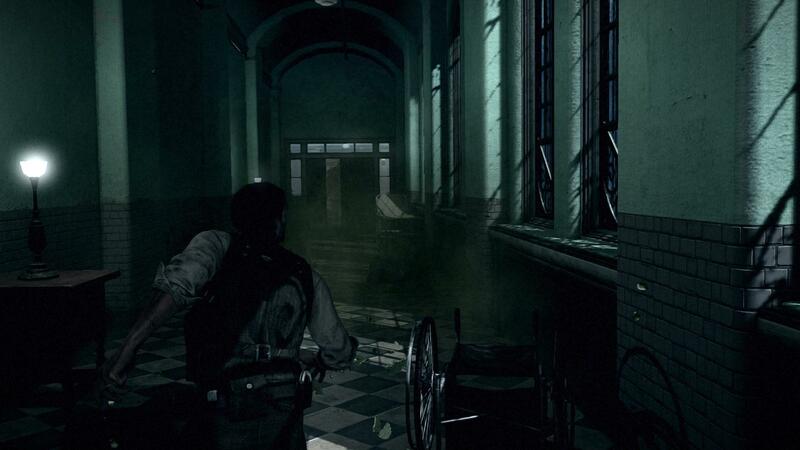 Here is where the gameplay began proper as Sebastian makes his way towards the entrance of the asylum. The player pauses to move the camera around to show the impressive environments. As Sebastian enters the asylum he tells the female detective to wait outside. Here is where Mikami’s signature dialogue comes out. It’s a combination of generic words and poor VO. I’m hoping they’re placeholder for the sake of this demo, which is entirely possible, because they’re at once distracting and comical, something I highly doubt was intended. Sebastian and his male partner make their way into the lobby of the asylum and see the aftermath of blood and bodies strewn across the floor. They reach the security room and approach the monitors. Real-time surveillance footage shoes several officers shooting off camera at an unseen assailant. With a flash, a hooded figure seems to teleport from one office to the next, slicing them open with a knife. As their lifeless bodies gout blood onto the floor, Sebastian barely has time to react before the hooded figure appears behind him and delivers what should be a killing blow. When Sebastian comes to, he’s hanging upside down in a room full of bloody, lifeless, upside bodies and is face to face with a hulking masked figure not unlike Leatherface from Texas Chainsaw Massacre. When asked what this character’s name was, all they said was “Chainsaw Guy,” so that’s what I’ll call him as well. Chainsaw Guy moves past Sebastian and proceeds to violently cut up another hanging victim. While we don’t see the actual violent act, we hear it in gruesome, wet detail. We do, however, see the body being dragged with its head dangling on its chest. When Chainsaw Guy is distracted with carving up the body in another room, Sebastian swings back and forth until he reaches a knife sticking out of another victim. He uses the knife to cut himself down and makes his escape. These moments are incredibly tense, as Sebastian needs to grab a set of keys hanging right next to Chainsaw Guy. Sebastian waits him out as he walks away and stealthily grabs the keys and makes his way to the locked door that leads to a stairwell. At the top of the stairwell is a long hallway. About a third of the way through the hallway Sebastian trips an alarm, thus causing Chainsaw Guy to show us very well how he got his game as be bursts through the door behind Sebastian brandishing a huge chainsaw, already started and thirsty for blood. Sebastian runs for his life, moving passed wheelchairs and stumbling over a gurney. During the extremely tense chase, Sebastian’s leg is cut by the monstrous chainsaw. Hobbled, he manages to escape the brutal spinning, almost gnashing, steel. From here there are a few beats of cat and mouse, with Sebastian using objects to throw and distract Chainsaw Guy as he makes slinks past the brute. Thinking he’s lost his pursuer, Sebastian looks for a way out of a locked room. Hearing Chainsaw Guy getting closer, Sebastian frantically looks for a way out. Realizing there isn’t one, he hides inside a locker and we see as Chainsaw Guy, visibly frustrated that he can’t find his prey, thrashes the chainsaw around the room and kicks down the locked door. Once again, Sebastian eludes his attacker until a final chase leads him to an elevator in the nick of time. He injects himself with a syringe and makes his way back through the lobby. Emerging from the asylum he sees the world he left when he entered the asylum is no longer there. In its stead, the parking lot has sunk into the ground and the entire horizon is full of raging fires, billowing smoke and collapsed buildings. The next part of the demo focused on exploration and combat. Called “Perth House” on the menu screen, Sebastian makes his way through a ruined building. A thin red line that gives way to white extends a portion of the way across the bottom of the screen. Sebastian finds a syringe and upon injecting it, the red line fills almost all the way up. Eventually the line fades from the screen and we see no HUD elements until Sebastian either switches weapons or fires his current one, and then a white pistol (or whatever weapon is equipped) with an ammo count appear in the top left corner of the screen. The first big combat moment of the game comes up and Sebastian must fend off what look like zombies with glowing eyes. We were told the nature of these beasts were purposefully vague because Tango Gameworks feel the unknown is far scarier. They’re not wrong there, usually. Unfortunately this is one of the presentation moments you hear about that just didn’t go the way they wanted it to. Not only are these enemies fairly rote, but the player kept shooting the zombie in the legs to drop it. He would then walk over to it to trigger a button prompt. Nothing would happen and instead the zombie would just get up and swat Sebastian. This happened 3 times before Sebastian finally shot the zombie in the head, blowing it clean off. He then walked over to the bodies and burned them. The entire sequence got a laugh from the room and I’m fairly certain that wasn’t the intention. It was revealed that incapacitating the zombies and burning them alive was an effective way to not only kill them but also to conserve ammo since this is a survival horror game after all. After that minor misstep Sebastian makes his way up some stairs and arms a proximity mine. Setting them up alongside the windows, he looks outside and sees a bunch of glowing eyes; there are zombie villagers with torches and pitchforks ascending on his location. They begin to break through the window as Sebastian aims his pistol attempting to pick them off one by one. The mines explode once zombies get near, and release all sorts of red gore and chunks. If this sounds a lot like Resident Evil 4, let me say, it really looked like it to. In fact the whole combat portion of the demo felt like a pretty version of Resident Evil 4. According to the Bethesda rep at the event, the game is running on a “heavily” modified version of id Tech 5 and the game looks it. It’s damned impressive to look at. Unfortunately the rest of my statement is also true. I’ve played games with the same exact perspective and combat scenario so seeing something so similar to gameplay from 2 generations ago was slightly disappointing. Knowing that he can’t possibly fight off all the monsters, Sebastian makes his way down stairs again and into a long hallway. After a flash he seems back further in the hallway. Looking back the way he came and again forward, he makes his way towards the door. Just as he nears the door there is another flash, and he’s back further in the hallway as if stuck in some sort of time loop. Walking forward again, we expect another flash but instead the door bursts open and a flood of blood washed towards Sebastian a la The Shining. As it is about to pummel Sebastian the flood disappears instantly, signifying a vision of sorts. Overall, there were some very impressive moments during the demo. The graphics are fantastic, the atmosphere is tense and foreboding, and the moments in the asylum were genuinely tense and suspenseful. Coupled with the last moments of the demo, clearly Tango Gameworks is on the right track for making a truly horrific, and scary horror game. What didn’t work was the voice acting and clunky dialogue. That was forgivable in 1996 when that sort of thing was new, but in this day and age when voice acting in video games evokes far more than a snicker or even a full on belly laugh, it most certainly isn’t. 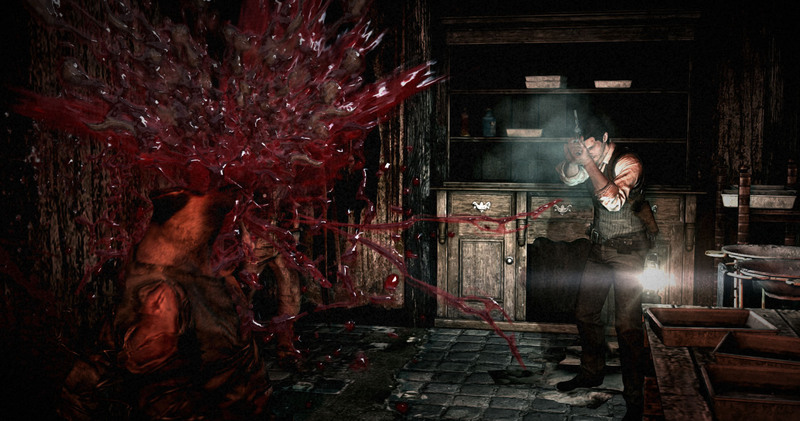 With the solid yet wholly familiar and generic combat, The Evil Within looks like it could be a really good game, and not a great one like I am hoping. Granted, this is a vertical slice of an early build of the game as it’s not due out until Q4 2014, so there’s plenty of time to improve the combat. With that being said, I’m a sucker for horror so even if it plays exactly the same, it’s a game I wouldn’t want to miss. Yeah. This won’t be out for over a year. When I first heard of this game through the vague vines Bethesda was cranking out, I was genuinely hooked. Add on the fact that Shinji Mikami is headlining the project, and I think we’re in for some solid performance. I’m interested in the voice acting you mentioned… On one side, this wouldn’t surprise me TOO much, as Mikami has always drawn some major inspiration for B horror flicks… But mah oh man, I don’t care if it plays just like RE4. 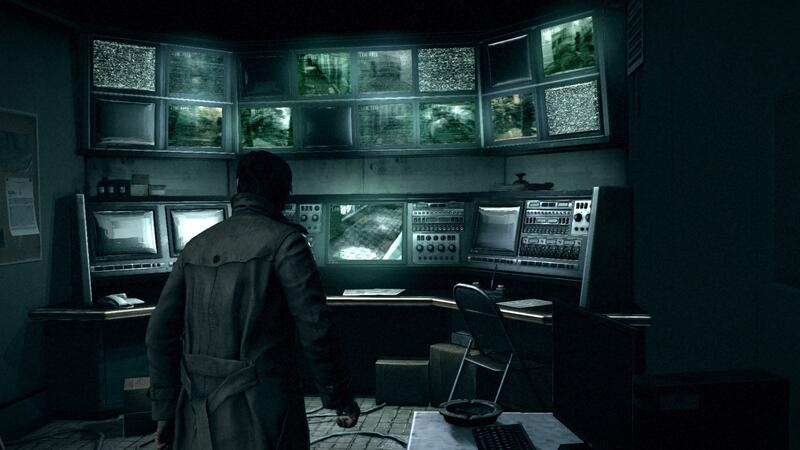 That game is still one of the best combinations of suspense, horror and action in… well, forever. I eagerly await to hear more!